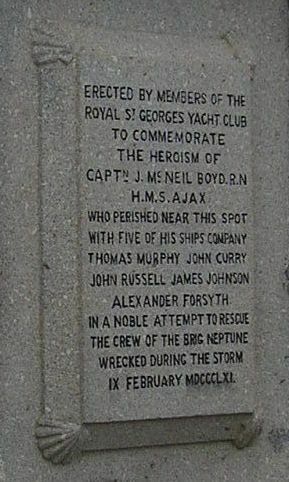 John NcNeil Boyd, captain of the coastguard ship Ajax, and 14 of his crew, were drowned whilst endeavouring to save the crew of a vessel which had gone ashore at the back of the pier. 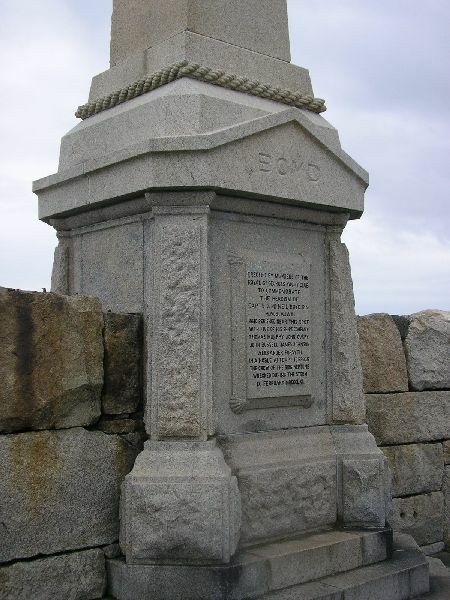 "Captain Boyd with his men were standing on the Eastern Pier, endeavouring to save the crew of a vessel which had gone ashore at the back of the pier, when a wave swept them all into the sea. Mr. John Mulvany, architect, was with them, but was saved. "KINGSTOWN, 2 30 p.m. - As far as can be ascertained, 16 vessels have gone ashore in or about Kingstown Harbour. Many lives have been lost in addition to those of Captain Boyd and boat's crew." Last night, about 9 o'clock, one of the severest gales remembered in Dublin for many years set in from the south-east, and continued to rage up to an advanced hour to-day, accompanied by heavy rain and sleet. 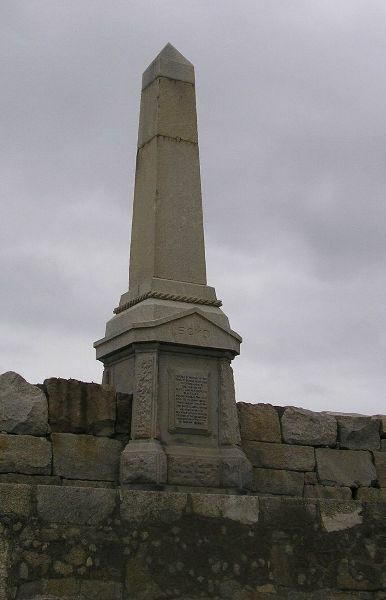 In addition to the sad disasters at Kingstown already detailed, numerous shipwrecks have occurred along the eastern coast, in the neighbourhood of Dublin, and it is much feared that the destruction of life and property has been considerable. "The storm that wrecked the Royal Charter was one of the most violent, for its duration, within the last 20 years. Great damage was the consequence, besides the loss of a noble ship, large property, and many valuable lives. The storm of Friday night and Saturday was still more violent and destructive in its ravages. No phenomena indicated any unusual interruption to the fine weather that prevailed during the last few weeks, which reminded one of the softness of April rather than the harsh and tempestuous days of February; but in the afternoon of Friday the barometer took a sudden turn and rushed down, while the weather-vanes whirled violently between north and east. At midnight, or a little earlier, the storm set in with frightful fury, and raced without intermission until late in the afternoon of Saturday. It gradually subsided towards nightfall, and, though high wind prevailed during Saturday night, it did not approach in fury the storm of the morning. Though the wind blew from between north and east, and more to the north than east during its greatest violence, yet the rush frequently took a wider compass, and appeared to come from the south and west. The storm was or the true cyclonic character, and, as had been anticipated, accompanied with frightful losses, All along the coast we hear of lamentable disasters, but the complete loss will not be known for some days." "It is too true about the fate of poor Captain Boyd, of Her Majesty's ship Ajax, and his gallant companions. They are gone - lost in their humane efforts so save the lives of their brother sailors. Captain Boyd, you are aware, was an Irishman -I believe a native of Derry. During his sojourn among us he gained the esteem of all for his many good qualities. A nobler fellow never trod the deck - beloved by his officers and men. The particulars under which he came to his death are as follows:- Three large brigs were perceived drifting in towards the rocks at the back of the East Pier, near to a short breakwater that was run out some time ago. Captain Boyd at once observed their perilous situation, and, with the true spirit of a sailor, immediately summoned his men to man boats for the pier. They landed, and at once proceeded to the other side of the pier, where the vessels were drifting. The vessels came on and were smashed on the rocks. The shrieks of those on board were heard far above the tempest. Ropes were thrown towards them, but they were driven back by the force of the storm. A mortar was used to throw a line, but it was utterly useless, the wind being too strong. The poor sailors were then seen to throw themselves overboard, and met with instantaneous death. Some of Captain Boyd's men procured ropes, lashed themselves with them and plunged into the surf, to endeavour to get on board either of the ill-fated vessels, but tho sea was too powerful. At this time a large number of people collected, all willing and able to assist, but their good intentions were powerless. Their fellow-creatures were drowning before their eyes at a few yards' distance, and nothing could be done to save them. Captain Boyd saved a few of his own men from death by pulling them out of the surf. It was at this time, 12 o'clock noon, blowing fearfully. At last there was a treacherous lull, and an enormous wave came round the point of the breakwater on which he and his brave crew were standing, and, as it receded, swept all that were there into the sea-the gallant captain and his courageous crew were seen no more. Others who were standing as spectators narrowly escaped death; fortunately they were extracated in time from their perilous situation by others. A man named Anderson, who was standing within a few yards of Captain Boyd, got his thumb jammed between the rocks, and thus was miraculously preserved to his family. Those who escaped were bruised and otherwise wounded by the rocks. Tho doctors of the town dressed the wounds, and those sailors who were injured were immediately taken on board the Ajax, and attended to by Dr. Buchanan, the surgeon of the ship. This gentleman broke the sad intelligence of the fate of poor Captain Boyd to his wife, who resides on board." "On Friday, the 8th, the weather was very rough, but not stormy; the wind north-east, and right in for the harbour. A brig tried to go out but could not, and in tacking went ashore close to the lighthouse. We saved all the men, but the vessel was dashed to pieces; she was laden with salt. On Friday night it blew very heavily from north-east and on Saturday morning we could not see a particle of the wreck. The mail steamboat Leicester tried to go to Holyhead, but had to put back, having been nearly lost in the gale. It was dreadful to see the waves. Some dozen vessels at sea endeavoured to put in for shelter; all but four succeeded. The first, a fine brig, ran on the rocks 500 yards from our ship. Our people were all on shore trying to save the crew; they saved one man, the master; all the rest, five, were drowned. At the same time another vessel ran on the rocks close to the first. She was lost, and three men out of five were drowned. A third vessel was driven ashore, but the crew escaped. The rocks were all crowded with our men, trying to help the crews of the wrecked ships, and a lot of people from the town were looking on. I cannot describe properly what occurred, but a sea like a mountain came and washed every one off. Many were carried up on the land, and drawn back again by the waves. How many were drowned we cannot tell as yet, but we have recovered nine bodies, some from under stones a ton weight. Twenty-one townspeople were lost that we know of, and we expect there were more. Our loss from tho Ajax was Capt. Boyd, John Curry, seaman; James Johnson, A.B. ; John Murphy, seaman; A. Forsyth, A.B. ; and John Russell. The captain's body is not yet found. Our gunner, Mr. Farren, is much cut by the rocks, and a dozen more are in the same condition; they are all in bed. Our ship is very sad and lonely. The gale is all over now. There have been thousands of people from Dublin to see the place where the wrecks occurred and where our sailors were lost." The remains of the lamented commander of the Ajax were consigned to their resting place in St. Patrick's Cathedral yesterday, amid extraordinary demonstrations of respect from the people of all classes.